Peter Hain (We need to wake up and tackle BNP poison head on, 29 April) baldly states that "with unemployment and job insecurity rising, some major construction sites appearing to bar local unionised labour, and affordable housing in short supply" we have the classic conditions to feed support for the BNP, seemingly without feeling a pang of guilt about the role his party has played in government in creating these conditions. Surely if jobs, workers' rights and decent homes are what concern ordinary people then the best way to counter the BNP would be to offer an alternative to vote for that supported these things. 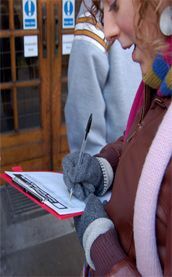 After over a decade of New Labour in power, Thatcher's anti-union laws are still in place, there has been a freezing of new council house stock and their participation in the EU includes support of the posted workers directive, which makes it legal to effectively "bar local unionised labour". So clearly a workers' alternative will not come from Labour on 4 June! That's why the RMT-initiated No2EU - Yes to Democracy slate is so important; with this pro-trade union, anti-privatisation, non-nationalist alternative to the establishment parties and the BNP, working people can cast a positive vote rather than being told by Hain and his like to hold their noses one more time and vote Labour.